A pan full of pasta, lots of Tzatziki or a doner kebab with everything – many people’s mouths would already be watering in anticipation. Delicious dishes, particularly from Mediterranean cuisine, get their flavour from the use of plenty of garlic. 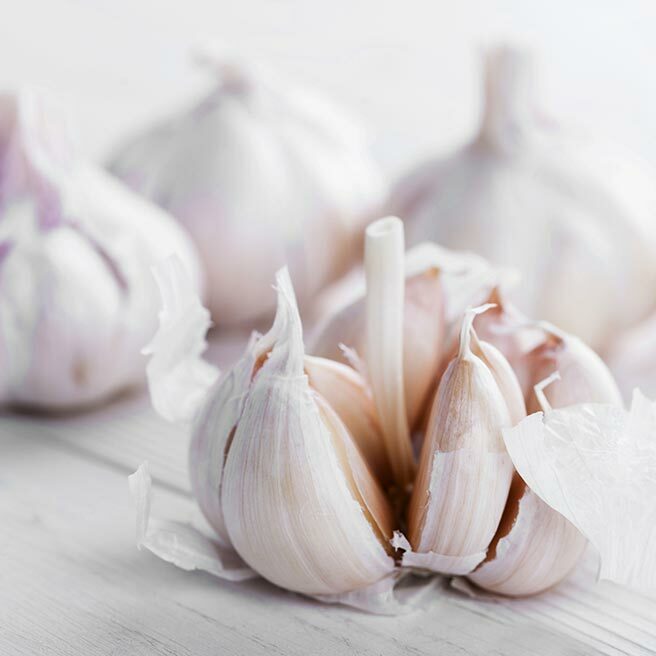 It tastes great and it’s healthy – but with the notorious garlic breath, the unpleasant mouth odour, it’s not at all good. You can learn about home remedies to help combat this garlic breath here. The science is clear: Garlic is healthy. This is due to the active ingredient alliin. The substance has antibiotic effects, it is antibacterial and has a positive effect on the circulation. That’s all good news for garlic fans. What’s less good, is that when it is cut, cooked or chewed, alliin is converted into the intense-smelling essential oil allicin, which is what actually causes you to have bad breath after eating garlic. Garlic breath doesn’t develop like other types of bad breath, through food residue in the oral cavity, but instead it comes from inside the body: Allicin is released into the bloodstream during the metabolic process and is distributed through the body and released through the lungs and skin. The sulphurous substance sometimes smells more intense, sometimes less – however, as a general rule, the smell is always unpleasant. No cosmetic measures like deo or chewing gum can really help against this type of bad breath – even if showering is always traded as a “hot tip”. Now tips and home remedies, like drinking a glass of milk or chewing parsley, that help to combat the smell produced by the allicin in the garlic are in demand. The most effective tip: Don’t go anywhere near garlic if you want to be absolutely sure to avoid the smell. One tip that could make you feel lonely: Simply wait for around 20 hours until your body has completely ridded itself of the substance. However, if you don’t want to forego the taste of garlic in your food, fry the (small sliced) cloves of garlic in olive oil and just take them out of the pan straight away. In doing so, you can enjoy the flavour of garlic but the smell is kept within reasonable limits. When you are cooking for yourself, you can make sure that your recipe will not excessively load your breath with the smell. In contrast, there is a huge amount of garlic in restaurants or kebab shops. So what can you do now? The most famous home remedy: Drink a large glass of milk, preferably whilst you are eating garlic. The fats present in the milk keep the garlic smell at bay. If you don’t really like the sound of this combination, order green vegetables like spinach to accompany your garlic feast instead. Chlorophyll absorbs the odorants. After the meal it helps to chew parsley, red coffee beans, a slice of fresh lemon or, like people in India do, cardamom. For the more intrepid: put plenty of parsley in a glass of milk, purée and drink. But some people will probably prefer to stick to more traditional tips, like chewing gum. However, a good alternative is: Stozzon Chlorophyll Dragees, which can influence the enzymatic processes in the body. It is important that you take several Stozzon Chlorophyll Dragees before, during or directly after mealtimes, as this way they can directly become part of the metabolic process. In doing so, you can prevent odour formation, development and bad breath from inside out. Stozzon Chlorophyll Dragees are a method which is simple to use and effective. To comfort you: If home remedies really don’t help, at least “positive thoughts” can help. After eating garlic you may possibly smell unpleasant – but at least you know that the garlic is working its beneficial effects on you! Garlic smell and bad breath aside.